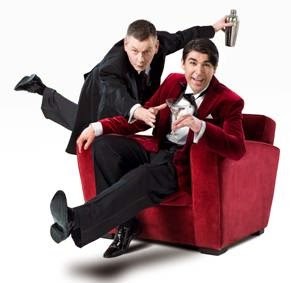 John Gordon Sinclair returns to the stage in Scotland and will for the first time perform in a Glasgow theatre as one half of the iconic duo Jeeves and Wooster. John had West End audiences rolling in the aisles with laughter as the unflappable valet Jeeves in the Olivier Award-winning hit Perfect Nonsense. Starring alongside James Lance as the charmingly incompetent Bertie Wooster and co-writer Robert Goodale as Seppings, the trio will be serving up the laughs at the Theatre Royal Glasgow on Monday 24 November for one week only. When asked how he felt about embarking on a UK tour, John Gordon Sinclair said: "Being a family man I was somewhat reluctant for Jeeves & Wooster to leave the West End and go on tour, but for one thing...I knew the show was going to Glasgow. I haven't been on stage in Scotland in over thirty years & if I'd dreamt up the scenario myself I couldn't have imagined a better situation. There's no city I'd rather be playing, there's no show I'd rather be doing...The Goodale Brother's Jeeves & Wooster is a belter."